Unfortunately, most equine caretakers are unable to perceive abnormal movement in the horse, extending the period between the onset of a problem and its eventual treatment, and the longer an issue is allowed to persist, the greater the chance that it will progress. This spiral bound book with hundreds of illustrations, dozens of charts, and links to online videos of explanatory case studies, gives readers a complete course in observing, identifying, and decoding equine lameness. Author Dr. Bob Grisel helps you interpret what is seen, plain and simple, no need for medical knowledge of equine anatomy and pathology. 264 pages. 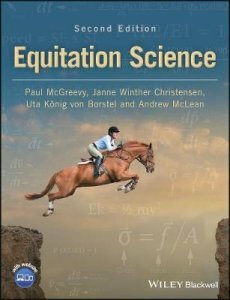 A new edition of a highly respected textbook and reference in the rapidly emerging field of equitation science. Equitation Science, Second Edition incorporates learning theory into ethical equine training frameworks suitable for riders of any level and for all types of equestrian activity. Written by international experts at the forefront of the development of the field, the welfare of the horse and rider safety are primary considerations throughout. Regardless of discipline, level of expertise, training philosophy, body shape, or fitness level, all riders do better—in horse-related activities both on the ground and in the saddle—when they take care of their bodies and maintain their fitness in ways other than just riding. While riding is a great way to enjoy an active lifestyle, on its own it is not enough to condition and tone the body to the degree we need, and then the horse must make up the fitness gap in our physical partnership. If our reflexes are slow, if our bodies fatigue, if our position collapses, if tension patterns appear, then the horse suffers repetitive asymmetrical strain or develops compensatory movement habits. The beautiful bay Winx has transcended the track to become a national icon, earning the affection and acclaim usually reserved for just a chosen few. Since the start of her extraordinary winning streak, Winx has run like a horse possessed. 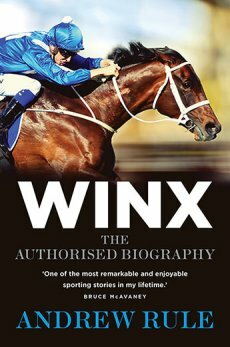 Winx: biography of a champion, is a book not just about an extraordinary horse, but about the people who made it all happen, their hopes, dreams, a whole lot of hard yakka and, sometimes, hard cash. By racing aficionado and bestselling writer of Peter Moody’s A Long Way from Wyandra and with 48 pages of stunning colour photographs, the book is essential reading for racing fans everywhere. This great Australian sporting legend deserves nothing less. Hardback 328 pages. In Winx: The Authorised Biography, Andrew Rule, her owners, her breeder, her trainer and her rider tell the real story behind the story of the world’s greatest racehorse. Australia’s world champion racehorse Winx has become a sporting giant, transcending racing in the same way that Muhammad Ali transcends boxing and Donald Bradman transcends cricket. She is undefeated in a winning streak of 25 races over three years-which includes three Cox Plates, the Queen Elizabeth Stakes and a record number of other elite Group 1 races. She is described by her trainer, Chris Waller, as a supreme athlete-a world-class sprinter with a freakish ability to dominate longer distances ‘like Usain Bolt running in 1500-metre races’. She is the Phar Lap of the modern age, and one of the greatest racehorses in 300 years of Thoroughbred racing. Hardback 400 pages. When owning, training, riding, and showing horses, there is a certain “look” to which one aspires. Often it is set by the horses seen on television, at special events, in public performances, and in top competition around the globe. World-class “turnout”—a horse in peak condition, perfectly coiffed and luminous with good health, outfitted with gleaming and well-fit tack appropriate for his sport—literally takes your breath away. No one knows how to do all of this better than those working as “professional grooms” in the barns of the world’s top riders and trainers. It is the responsibility of these elite experts to keep their four-legged charges happy, healthy, and primed for peak performance—in body and mind. Now, two of the best professional grooms in the business share their trade secrets, with over 1200 color photographs demonstrating how to clean the horse from nose to tail; wrap, clip, braid, and ship him; prepare him for or present him in various English competitive scenarios; and care for him after work or showing so he is rested and ready to do it all again. 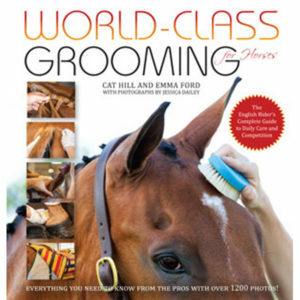 This book is everything you need to know from the pros: The ultimate modern-day guide for all riders who want their horses to look and feel their best. Anatomy is often said to be boring, but nothing could be further from the truth. Anatomy, particularly functional anatomy, is a vital and dynamic subject, an appreciation of which leads not only to superior horse management and welfare, but also to a better understanding of the anatomical challenges associated with riding, training, overtraining, injury, and rehabilitation. Using Alexa McKenna’s fabulous illustrations, this book shows the correlation of the skeleton, muscular system and locomotion, providing a clear insight into the functional and dysfunctional horse. It addresses the largely misunderstood concept of “perfect conformation” and looks at the effect of the rider and tack on the function of the horse, using cutting-edge diagnostic techniques such as thermal imaging and gait analysis. If there is one name in the American equestrian story that everyone knows, it is George Morris. His carefully chosen words are notoriously powerful. They can raise you up or cut you to the quick. His approval can be a rainmaker, his derision can end a career. But as much as people know and respect (or, perhaps, fear) the public face of George Morris, he has lived, in other ways, a remarkably private life, keeping his own personal struggles with insecurity, with ambition, and with love behind closed doors. It is only now that he has chosen, in his own words, to share the totality of his life—the very public and the incredibly private—with the world. This engrossing autobiography, the real story of the godlike George Morris, beautifully demonstrates his ultimate humanity. This engrossing autobiography is the real life story of the man. A journey through the American dressage evolution- where it’s been, where we are and where we need to be. Almost 20 years Anne provided commentary on the state of dressage in the Unites States and around the world. Anyone with an interest in dressage, its controversies, and its most famous names, will enjoy Anne’s stories, but the true value is in her ideas for improving our horses, our riders, and our ability to compete on the international scene with success and integrity in the years to come. International bestseller Beyond Horse Massage Book and DVD, Jim Masterson, creator of the Masterson Method, has received countless requests for an easy-to-use visual aid to always have on hand in the barn. The result of this popular demand are these large-format hanging wall charts, clearly providing the quick-reference photos and step-by-step instructions for 13 Masterson Method techniques. More easy-to-learn lessons in natural horsemanship for kids! Andrea and Markus Eschbach, authors of the bestselling book How to Speak Horse, are back with another fabulously illustrated introduction to safe and fun horse handling and riding skills. Beginning with the basics of how horses use body language to communicate, Andrea and Markus teach children how to “listen” to what their horse is saying and “talk back” in a way he understands while leading, grooming, tacking up, and eventually riding. With a focus on building the horse’s trust in his human partner, young riders gain confidence through exercises on horseback. Best of all, Andrea and Markus nurture a habit of care and respect for the horse that helps prepare children for a lifetime of rewarding time spent in the company of horses. Beyond Horse Massage Book by Jim Masterson. Would you like to enable your horse to perform and feel better, to overcome old limitations and restrictions and reach its full potential? has a quick reference section will point you to exercises that are specifically suited to your particular discipline, may it be dressage, endurance, eventing or barrel racing, or others in the vast realm of horse sports. Jim Masterson was Equine Massage Therapist for the 2006 and 2008 and 2010 USET Endurance Teams, and for equine clientele competing in FEI World Cup, Pan American and World Games competitions. He teaches a unique method of equine bodywork, in which the practitioner recognizes and follows the responses of the horse to touch to release tension in key junctions of the body that most affect performance. Architect Keith Warth gives advice on basic stable construction, DIY stables, the use of old buildings and large-scale equestrian stables. Also examples of how the buildings can affect aspects of hygiene, including alternative solutions for drainage and other services. Essential reading for professional riders, keen amateurs or anyone contemplating building, refurbishing, or converting stables. Focused tells the story of the boy from a farm in New Zealand who came to Britain as a raw 18-year-old and conquered one of the most demanding sports in the world – competing in six Olympic Games and six World Championships and becoming World Number One. Illustrated with many previously unseen superb photographs of Andrew’s eventing career and life with horses, it reveals how he got to the top and how hard he still strives to up his game, and many of his innermost thoughts about the sport to which he has dedicated his life. 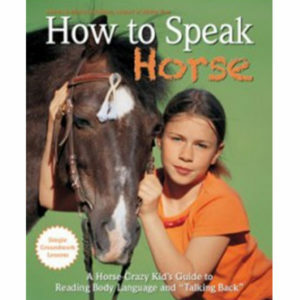 This book provides an introduction to easy groundwork exercises for you and your child to learn how to read your horses body language.Easy lessons in ‘horse speak’ for pony-mad kids. This lovely book, full of beautiful colour photographs, explains the basics of horse body language and how to ‘talk back’. With a focus on groundwork that is safe and fun for children, it provides and introduction to natural horsemanship and shows how good communication can keep you safe in everything you do with your horse. Like perhaps no other couple in this world, Magali Delgado and Frédéric Pignon have strived to live their lives in perfect partnership with their horses. It was this essence—in combination with their genuine talent, unquestionable integrity, and immense appeal—that captured the hearts of audiences around the globe when they and their horses toured as part of the original cast of Cavalia from 2003 to 2009. Now, in the eagerly awaited follow-up to their bestselling book Gallop to Freedom, Magali and Frédéric welcome us to their home in France. There, the stable doors are thrown open, and we are invited to share all that they’ve discovered in both the hands-on and more delicate, intangible areas of horsemanship. 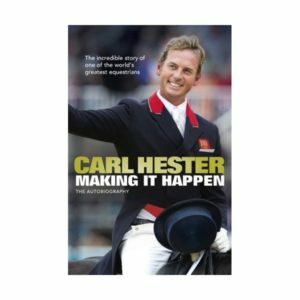 Carl Hester’s outstanding career was crowned by leading Great Britain to Gold Medal victory at the London 2012 Olympics. In his memoirs, he tells the captivating story of the passion for horse riding which transformed his life and made him the champion he is today. Jochen Schleese’s life mission is to protect horse and rider from long term damage. His new book reveals common and serious effects of ill-fitting saddles: sore backs, chipped shoulder cartilage, undiagnosed lameness, hock injections and atrophy!